Normal blogging activity will hopefully resume soon, once I shake the winter doldrums. Meanwhile I have enjoyed looking at flower pictures from sunnier days when writing this post. Poor Dominique braved freezing conditions this past weekend to bring us her photographs. Go and have a well deserved hot chocolate my friend! This is one of the wild South African Gazania, from which the garden varieties have been bred and selected. The flower pictured was on a plant grown from seed sent from Silverhill seeds in South Africa. Quite widespread in the wild, the species is quite variable in leaf texture and flower colour – which through assorted shades of orange. The dark spots at the petal bases can be absent also. The widespread distribution in the wild explains the adaptability of Gazania in cultivation. Forms from summer-rain areas at higher altitudes may be hardy to zone 7 or 8. 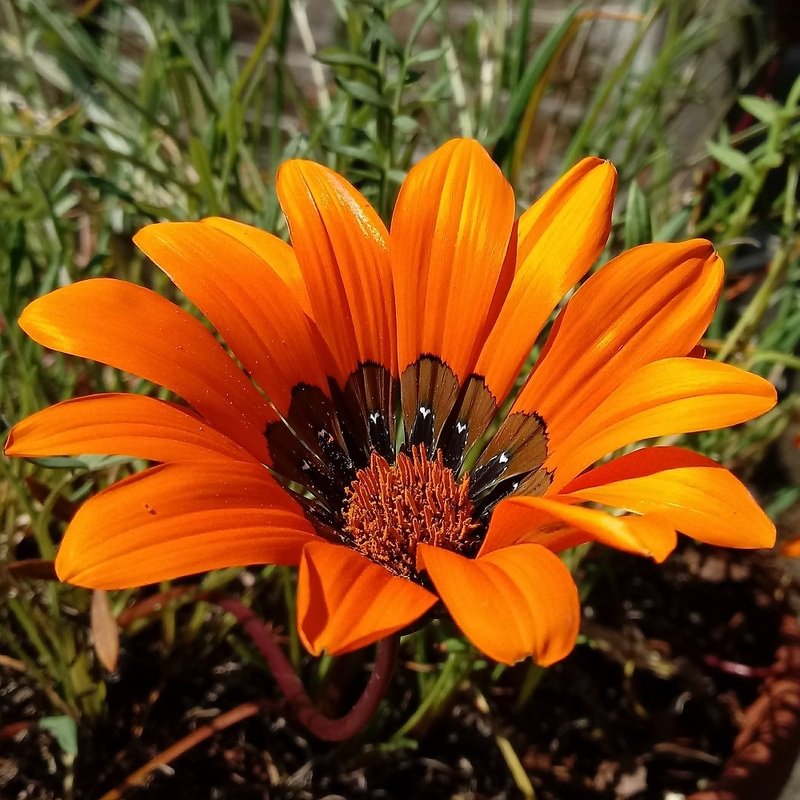 This perennial species is one of the components of the spectacular displays of daisy species in Namaqualand in spring, along with annual species such as Dimorphotheca. Fashion Inspiration by 3C Style, 3CStyle photo by Marie-Claude Viola. Ski art by Lisa. Collage by Lisa. This is the perfect plant to illustrate Dominique’s ski pictures! Gentians are classic alpine flowers. Visitors to European ski resorts in summer will see these where the snow has melted. This species is probably Gentiana acaulis or clusii though there are several similar species. Appropriately it is the symbol of the Alpine Garden Society here in the UK. The photo above was taken by me in the Italian Dolomites. The one below was taken in my own garden. Gentiana acaulis is generally a very easy rock garden plant. It has had a reputation for being shy-flowering but there are some reliable forms available now. It also appreciates a good dose of fertiliser in the spring. Though typically flowering in late spring, it will produce occasional flowers throughout the year – in my garden it had a single flower open on New Year’s day this year. Fashion Inspiration by 3C Style, 3CStyle photo by Marie-Claude Viola. First collage by Lisa, others by 3C Style. Flower photo credits see below. Dominique’s signature colour is teal. Teal coloured flowers are not common so since getting to know Dominique I have noted them whenever I see one. When she announced she wanted to use teal this month I jumped at the chance to feature this spectacular plant! Puya are bromeliads (as are pineapples). Many bromeliads grow on tree branches up in tropical forest canopies but Puya have spiny leaves and live on rocky slopes in arid areas. They are also much more cold hardy than their tropical cousins, with Puya berteroniana, from Chile, reputed to withstand several degrees of frost. Temperature-wise it should be OK in my zone 8 garden but it would struggle with my high winter rainfall and so I do not grow it. Which is why I have arranged for photos from other sources. These first photos, showing a more blue/teal form, are used with permission of https://strangewonderfulthings.com/101.htm which is a great source of further information also, and maybe seeds! Ok, there are no flowers here but I could not resist sharing this. See the other two blogs for more! Lisa’s onion/eye artwork this month (see Lisa’s blog – you can get a preview in the Gazania collage above) was based on an onion I drew as part of this mixed composition of Indian spices/ingredients. I love what Lisa has done with it, from an idea by Dominique. Previous Happy New Year? Molly is not so sure…. Such wonderful flowers this month and the colors are spectacular. The onion eye is one of my favorites. I love that we were able to take our art and put it together. We will have to do this again.😍 Fantastic post my friend! Love and hugs! Thank you Lisa and absolutely agree that we must find other opportunities to collaborate. Love and hugs to you too😄😍! Lovely post Darren. Thanks for finding these great flowers for our January edition. The alpine Gentiana acaulis was indeed perfect for the ski outfit and the teal Puya is just out of this world. Great artwork too. I’ve got a huge crush on the onion/eye! Very happy that our concept idea came out so nice. I will never look at an onion the same way ever. 😊 By the way, the first collage of the ski outfit and the skating one are from Lisa not me. Thank you my friend. Lovely working with you as always😄❤. I will correct that collage credit now – thank you😄. It is indeed a bummer that we live so far apart. 😢. I can’t wait! 😍 And yes, I will take you to the alpaca farm. I know you and Lisa will enjoy this visit. You will need to stay for many days. We have so many things to do and see together! On my way to write you an email. Glad you liked them my friend. Am just leaving work. Sunny here and very frustrating being stuck at work today! Try to stay warm. If it makes you feel better Dominique tells me it is -26 in Montreal…. A riot of colours to boost a grey January and lift any grey mood. Beautiful selection of photos Darren. Thank you Marie😄😍. We got some rare sunshine today. Pity I was at work…. And you probably have snow tonight!! Minus 26!! Oh God! I’m not awfully sure that I could cope! And a friend in Australia reports +42C. Makes me glad to be somewhere in the middle! Though I’d much prefer +42C to -26C! Yes, me too! I can’t bear the cold … particularly gardening in the cold when your fingers are freezing and you’re mucking about with little fiddly bits of string, or the lock on the shed when it’s frozen …. arghhhh miserable! (But it’s better than when it’s raining … then I’d rather just stay in bed!). Yup, give me heat any day of the week! Definitely. I don’t mind gardening on cold but sunny days but hate cold damp days when the cold just seems to seep into the old bones. I was at a lecture last night and the hall caretaker had forgotten to put the heating on. It was less than ten degrees and I was sitting in there for 3 hours. I am still not warm! Wow! I can’t get over the Gazania. What a brilliant color to liven up this time of year. I know it blooms in the summer but it makes one want to dream of warmer days now that winter is here in full force. The Gentian is also of particular interest because a local soft drink called Moxie is flavored with Gentian root. It is nice to see the blooms. But the true star of this post, besides Dominique, is the Puya. I’ve never seen it before and I’m stunned, to be honest. It’s definitely a WOW plant. I love your onion art, too. Combining it with Lisa’s eye is really cool. Yet another great post! Looking forward to next month! Gazanias grow wild here and are considered a weed, as I’ve probably told you before. I love them though. The bottom drawing is just beautiful – a good one to consider for your kitchen range – a platter perhaps or a bowl? Thank you so much Linda💕. Dominique will be in touch about Moxie as we have a future post planned about flower and fruit flavoured drinks😊. There are a lot of South African plants banned in Aus for this reason. Similar climate but lack of natural predators and they go mad. Ironically one of them is Gladiolus cariophyllaceus which is an invasive weed in Aus but critically endangered in its native South Africa. Great post and the plant photos are amazing. I love the vibrant oranges. It really is perfect for that. You could have a whole kitchen range. Maybe look into what options there are in China, which is where so many of the kitchen designer ware is produced. Am looking at print-on-demand services anyway, for mugs. So will investigate! Thank you Dee Dee😊❤️. You are such a good photographer yourself that this means a lot to me.